As an agent/broker, success depends on signing up new policies, servicing your customers, and running your business better than competitors. 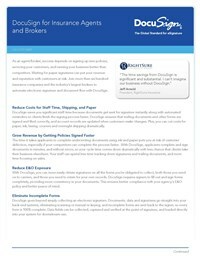 Waiting for paper signatures can put your revenue and reputation with customers at risk. Join more than six hundred insurance companies and the industry’s largest brokers to automate electronic signature and document flow with DocuSign.